In the process of placing my second order, I wanted to send an email regarding how Diatomaceous Earth worked for me. I am no longer awakened in the middle of the night with hip pain, but the first thing my husband and I noticed was not being tired all the time. Having energy throughout the day, and not crashing midafternoon equals more projects, activities etc accomplished at the end of the day. We have shared this product with some friends. One of our friends is a painter by trade. He has (had) arthritic pain in his pinky finger which he could not bend to touch his palm without excrutiating pain, making it hard to work . After taking DE for about 11/2 weeks-he can now bend it with much, much less pain. Another friend who is balding on top, went to his barber. As the barber was giving him his usual flattop haircut he asked him what he's been doing because his hair was growing! Needless to say our friend is very excited about this product, which is why I am about to order 50lbs. One more thing. Carpenter Ants DO NOT like this stuff. I sprinkled it around the foundation of my home and have not seen an ant anywhere!! Thank you for offering this product and for keeping it so very affordable!! I have to tell you that Diatomaceous Earth is a 'miracle' in my life. For the past 5 years or so, my whole right side has been in pain. The last few weeks, the pain was excruciating. I had never contemplated hip replacement surgery, but the pain was so bad I would have had to do something if the DE had not started relieving the pain. I walked with a complete limp on the right side and could not bend down nor lift my right leg up to put on a shoe. After only 7 days, my husband and family can not believe what DE has done for me. Looking forward to continued healing the next several weeks. Now, about my DE. Been on a rounded tablespoon a day for 3 weeks this Friday. And I can already say, "Where have you been all my life"?! My back ache was gone in 3 days, been bad for about 3 weeks prior. Dry skin in now shiny, no flakes. And had trouble all this year with right knee locking up and very painful, down on knees working in my gardens, well, that has stopped, too!!! AND, I got rid of flea infestation at my sisters house she had been fighting with chemicals the last 6 or 8 months!! Fantastic stuff!! Thanks for being there! I want to thank you for selling such an excellent product. 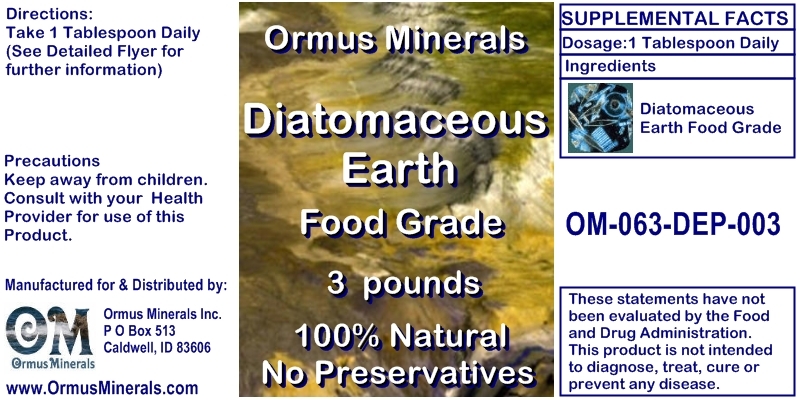 I have been using diatomaceous earth for at least 6 months and have noticed a tremendous change in my health. I am an athletic person and go to the gym 5 days per week in addition to my daily cardio routine. I am 56 and haven't felt this good in 5 years. I have arthritis in my shoulders, hands and feet. I no longer feel pain in any of those joints when I weight lift. I seem to have more energy during the day which has enabled me to extend my workout time. I've also noticed my hair and nails growing faster and fatty nodules have disappeared. This product works for me and I am so grateful to the company. After less than two weeks of taking "earth," I'm stunned by the results. My sister said to take it slow. I took one treatment daily for three days and then increased it to two treatments daily. I try to take it earlier in the day as it gives me too much energy before bedtime. Two days ago, I awoke in the middle of the night and noticed something. I had been suffering with severe pain in the bottoms of my heels. It was so severe that I couldn't put any weight on it. People would have to help me up and down stairs so I wouldn't fall. I realized in the middle of the night that I didn't have anymore pain in my heels. Unbelieveable, because I have been suffering with this heel condition for two years or more. Thanks so much. I'll be telling my friends. Andy Berard - Denver, Co. I do have a personal testimony to the awesome effects that DE has provided me. I have suffered from hip pain due to severe arthritis and the recommendation from my doctor was hip replacement surgery. I am 51 years old and lead a very active and physical lifestyle up until two years ago. Golf and tennis were no longer possible due to the pain I received during that type of activity. I finally gave in and scheduled my hip replacement surgery back in October for December 27th 2007. At the time of scheduling my surgery my son-in -law told me that he had family in New Mexico that suffered from severe arthritis and that Diatomaceous Earth had cured them. Of course being the huge skeptic that I am , I decided to research everything about DE and came to the educated conclusion , " What the hell do I have to loose". I started in October taking what I call the "DIRT" twice daily and within 2 weeks I started noticing a difference in how I felt. More energy. less pain in my joints and in my hip. Within 4 weeks I was 90% pain free. I called my doctor and postponed the surgery just in case this was a fluke because I had a huge golf trip planned for Arizona on Jan 18, 2007. Living in Colorado didn't provide any opportunity's to golf so the true test would be to see how my hip would do with 5 rounds scheduled for 3 days. Now, I am 51 years old and we are talking 90 holes of golf in three days. I haven't golfed that many holes in the past two years because it hurt so much. We'll we just got back from a beautiful weekend in Scottsdale, Az and I golfed like a rock star. I hung in there with the best of our group and I was "PAIN FREE". The true test for the effects of DE were absolutely incredible. Needless to say I told my doctor to shove it and he won't be operating on me and "THE DIRT " and I are best friends. I hope you include this real testimony as to the Miracle of Mother Nature. (Diatomaceous Earth). I am writing this in hopes that someone will read this and be helped like I am. I tried diatomaceous earth, using about 3 heaping tablespoons in a cup of water, to appease my husband. He said it would be good for my hair. It doesn't taste bad, it actually is good. However a week later we were driving to the store; I looked down and noticed I had nails. I have bitten my nails since I can remember. I went out and bought polish. I could not believe how fast they were growing and the urge to bite them was no longer there. My hair was also thinning in front and it is now filled in. When my 25-year old sister was pregnant, she craved chalk. Her husband would actually go to the store and buy her chalk to eat. I gave her some of the diatomaceous earth and she loved it. She quit eating chalk and took the diatomaceous earth every day." In September I went to Croatia. I experienced extreme sleepiness during and after my trip. I thought I had contracted a parasite, since I was drinking the water and later found out the water was not that clean. It was the same sleepiness I had experienced on my trip to Russia and I figured I had contracted Giardia, a parasite common in Russia. When I came home I began an aggressive herbal de-worming program, which is the same program I offered my clients. This program consisted of taking cloves, black walnut, wormwood combination and a product balled Rascal. I stayed on this treatment faithfully for three full weeks and even did higher dosages than was recommended in the directions. I figured I was relieved of any critters hanging on to my intestines. Right? WRONG! Two months later I went to a clinic and had live blood cell analysis to determine my condition. I was shocked to discover parasites in the blood. How could this be? I was following a program that was offered by some of the top parasatologists in the country. An angel came into my life recently. She was a client doing my supervised fasting retreat I offer in my residence. Bonnie GAVE me a container of Diatomaceous Earth and said "try it for you and your dogs". What have I got to lose but a few wigglies, right? Hopefully! Guess what? After only 5 days of taking the recommended dose I passed a 5 inch creature determined by lab analysis to be a round worm. Not me! Not beautiful, charming, squeaky clean diet Millan! Yes. I guess they are right when they say 90 to 95 percent of us have parasites and worms. You see, they are usually a-symptomatic, so you could have them for years and never know it! I have been taking a tablespoon of Diatomaceous Earth every day for the last 3 weeks and I have noticed the 2 dime size age spots on the right side of my face have disapeared! 1st of all, my cholesterol is down --- in fact, I cut my lipitor in half!! I introduced DE to my Sister and she loves it!! She says she just feels better! Last week She got the surprise of Her life. She has osteoporosis and gets her bone mass checked every few months. When she went in last week, her bone mass had actually increased!! She also noticed that all the age spots on her arm had disappeared. Wish I'd have found it sooner!! This thing is disolving my lipomas. They're shrinking every day. Lipomas are beningn tumors made of body fat. I take 3 big spoons daily and i've drinking it on a small glass with less than a half of water. I also noticed that my﻿ hair is growing thicker and my skin is softer and less dry. Helped in SO MANY areas!! I must say I was very skeptical when my sister told me about this "dirt". A friend of her husbands had been using it for several months with great affects. So they got some from him and tried it for two weeks and was already seeing some signs of it working. So we went in together and ordered a 50 lb. bag. I and my husband have been on it now for seven weeks. I have degenerative disk disorder, arthritis in hips, knees, ankles and feet. I also have been losing my hair for the past few years more and more, had dark circles and bags under my eyes and in a lot of pain for other problems and also weighed 273 lbs. AS OF LAST WEEK I HAVE LOST 14 LBS. my pain from arthritis and other pain has lessen tremendously. My hot flashes and night sweats which were horrible and down by at least 75%. (this alone was worth it too me), it has taken away my mood swings which caused me to have to stop watching my grandchildren because they got on my my nerves so much and I would get so angry with them and yell a lot. NOW I DON'T DO THAT...THANK YOU FOR THIS MARVELOUS "DIRT"...as we call it. My husband who has narcolypse/cataplexy has seen some improvements in some of his areas as well. We both have a lot more energy than we have had in years..WOW!...I get comments on my hair now, people saying is shines more and it is getting thicker as well and filling back in where it was thinning. The circles and bags under my eyes are gone and my complection has improved as well. I am so very pleased with this product of yours. I also have 5 more people in my church and two more family members on it as well....Just wish it was easier to get a hold of. Helping Cravings, Coughs, and More!! As for my family and I, we have noticed having a lot more energy and not having the food cravings like we use to. My husband is a smoker and he used to cough alot a night and ever since taking the DE, he hasn't been coughing anymore at night. My nails have been growing like crazy and my skin feels softer than ever and not so dry. I was so excited about the DE, that I gave some to my brother to try (which has to take medicine for his cholesteral and high blood pressure) and my neighbor too. My neighbor has already seen a lot of changes in his health. Just to name one, he was having problems with his prostate and was having trouble urinating. He was excited to tell me that after a few months of taking it, he no longer has problems with his prostate anymore or with urinating. My husbands parents have also order from your company after sharing this information with them. They are also excited to see what wonderful things the DE will do for them. I will continue to tell everyone I know about this wonderful stuff. I am a believer in the DE and its truly a miracle from God! May God bless you and your familes. Lower Blood Pressure and More! Dear earthworkshealth, Hi. This Diatomaceous Earth is a miracle to me. I have fibromyalgia and this DE is the ONLY thing I have ever found that helps me. But I'm worried. Is DE a common resource? Is there a chance that we will run out of DE in the next 20 years? I know this is an unusual question, but in a very real way my life depends on always having DE available and I'm worried sick that we will run out. Note from Earthworks: There is over a 100 year supply in the Perma-guard mine---plenty for our lifetime! Works for so many things!! Dear friend, The DE has been remarkable....having lupus, it has taken the symptoms away.....our dog Beau has been free of fleas and intestinal worms for over 5 months now. We have not seen a cockroach in our country home in over 3 months. We sprinkle it everywhere behind the appliances. My flowers have been harassed free for we sprinkle it around the base of all our plants. Got rid of fire-ants in one of my pots. Yep weez in Texas!!! Every morning I make up a protein fruit smoothie and add a heaping tablespoon for the hubby and me. It has helped his shoulder pain and he sleeps much better. When we ran out, the pain came back with a vengeance and he began the insomnia again. One day after getting the DE, he was back on track again. Thank you for selling a most marvelous product. We are your customers for life! Gave Me My Life Back! Less than two weeks ago I purchased your DE aka as 'dirt'. We started taking the 1 rounded tablespoon. Within 2 days my hot flashes were gone along with the helpless feeling that went with it!! I have never been so impressed with a product, it has literally given me my life back! Hi! On August 7th my husband and I began taking DE. He had been having severe pain in his one knee. Later that day he said it felt like he had less pain and I said that was ridiculous being he just started that day. But each day he seems to feel less and less pain. He's 89 years old and no one can believe it as he has been always on the go. My left foot has been so sore that at times when I would massage it, it felt like it was broken. I can barely feel any pain now. Two days ago I had an appointment with our Doctor. It is a known fact that usually people's blood pressure is higher in the doctor's office because of stress. Mine is usually around 126 over 76 (but higher in his office)with a pulse in the upper 80's but usually in the 90's. Tuesday when my blood pressure was taken, it was 110 over 70 with a pulse of 73. Shock for sure. We are hoping to see far more results, but am very thankful to you and our Lord for answered prayer. Helped Me in Many Ways! I bought DE from you guys about 4 months ago and have been taking it consistently. I have noticed that my skin seems to be thicker, my hair grows faster and my teeth even look like they are thicker. I feel alot stronger and I am thankful for finding your product because before I started taking it I was a mess. I was in a car accident at the end of 2008 when a drunk driver hit us from behind. I was very slow at healing, but once I started to take this the pain from the whiplash has gone down almost completely now. I also use this as a toothpaste because regular toothpaste makes me gag! I even used it to get rid of roaches. I spent $500 on pest management, but it didn't work. I put some of this down and roach problem was gone in a week. This stuff is so great it should be in everyone's home and I hope people start to realise that the cures for our ailments are right under our noses and come from the humblest of places-diatoms! Thanks again and god bless you all I hope your business continues to grow! I ordered some DE about 12 days ago and received it shortly thereafter. I started taking it 6 days ago and my right elbow is 95% cleared of the psoraisis I had there. I have had that about 2 years. I was amazed. This is a testimonial for the DE, I would like to tell you what it has done for me and my son-in-law. For him, he had a bald spot on the top of his head and he is only 38. He started taking the DE just once a day for 2 months now and he has new hair growing! Also our shoulders are very painful when we do something- he is a logger. Since taking the DE, the pain has lessened by half and we can both do things with our arms that were so very painful before. A friend said she heard it was good for skin problems. I had not heard first hand, but she said her friend who has skin problems because of allergy to the sunshine has had great results; my friend thought it would help my eczema, and it certainly has! The eczema on my neck that is common for folks in their fifties and older, is no longer sitting on the surface of my skin. It has gone below skin level, is no longer red and swollen, and 50% of the itching is gone! Yes! -I needed relief! I just wanted to say that I have been on your product now for about 3 months and it has been a miracle for me. I have stills disease, fibermyalgia, migraines, and narcolepsye and had been bed ridden and have never been able to make plans, I have always had to play each day by the moment. I have been on so many pain killers has I have been in terrific pain all the time. Since I have been on your product just one tablespoon a day in yogurt it has truely given me a new life, no pain and so much energy that I have not had in 25 years. I feel great and so many people tell me how great I look I am 49 years old and I feel 20 again. I is now working on limiting my migraines that I am now so thankful for. I am a perfect example of this miracle powder, it has worked wonderes for me. Thank you so much. Hi, I am 53 and until a few years ago had enjoyed very good health. But I have gained over 30 extra pounds and was having issues with psoriasis, fatigue and hormonal imbalance related symptoms. I haven't been able to lose weight no matter how hard I try. Just looked on the calendar, it was "Earth Day" lol ,when I started taking your wonderful product, so that was about 2 weeks ago ! A dear friend shared some of her order with me. Within a couple of days, one of the most noticeable benefits was that my usual hunger and cravings for salty or sugary foods began to disappear. My energy level has improved, and the psoriasis is clearing up. I am also noticing a very calm contentment, or balanced feeling, not the usual shaky ~ almost a blood sugar imbalance feeling~ I was dealing with in between meals. I am feeling satisfied with smaller portions of food, and have lost a couple of pounds already and I know this will continue. In addition, I had been trying to quit drinking coffee for years, as I knew in my heart the Lord was convicting me that it was bad for my health. From about the third day of adding the DE to my morning drink (instant breakfast)or cereal, I haven't had any desire to drink coffee. Thank you so much for providing it at such a reasonable cost ! I have told several people about DE--may the Lord continue to shine His blessing on your business and lives. Another testimonial. I've been adding diatomaceous earth to my orange juice for about 1 week and for the first time in several years I can actually make a fist without severe pain! And my knee feels much better too. Also got rid of the ant infestation and the bugs on the plants. Can't wait 'til the fleas comes this year! Now there is a statement for you!!! I thought about this for about a year before I ordered, and am sure glad I gave thinking and acted. THANKS! Your u-tube video is what convinced me to give it a try. I've just started using DE about a week ago.....I can't believe the results I'm getting!!! My hair is shining and hasn't done that in a long time. My age spots are disappearing. My brain is clearing...I don't feel "foggy" anymore. I've noticed that my skin, which was starting to look like "old lady skin" is starting to look a lot younger. My teeth feel so clean and in the morning don't feel "yukky". I have energy again!! My constipation has gone. I'm telling everyone about DE. I can't believe how great DE is!!! Thanks, thanks, thanks!! I?m overjoyed! I am a 60 year old man. My Achilles Tendon on my left leg had been inflamed and causing extreme pain for almost one year. I was actually becoming desperate in looking for a remedy since I had no successful results from other methods. A friend of mine called me one evening and read to me a testimonial from your web site about a similar healing that one of you users had shared. With his recommendation and the testimonial I was ready to order. I have been taking the DE for approximately three months now, and my pain is virtually gone and the large lump at the bottom of my Achilles is about 50% smaller than it had been for almost one year. I can now walk normally again, without pain. I had become so accustomed to limping that I now feel like a kid again. My name is Sheree, I have been taken DE daily since i got it. It has been about 2 months. My cycles have always been heavy, but since using DE they are mild to almost nothing! My bowl movements are also regular now. All of the buildup is starting to come out! I know it may sound nasty but DE is helping me alot. I am also starting to lose weight as well! Thanks Earthworks! I started taking Diatomaceous Earth on Valentines day of 2010 and all I can say is THANK YOU! I have been keeping a DE journal because I wanted to document every possible change that I might experience. I used to have cramping every month since I was 12 years of age, but it wasn't so bad after I had my fist child at age 18. At the age of 32 I got a tubal ligation done and the cramps from my menstrual cycle hereafter are so severe that I have to take Aleve, a pain medication in order to calm it down. Now that I am 44 year old and going through pre-menopausal symptoms, My hormones are out of whack and the pain continues to plague me. After taking the DE for 30 days the pain is gone completely. The anxiety from going through changes from my pre-menopause has subsided tremendously! I am overjoyed that I have had a stress-free painless period, and the calmness of my nerves. DE has regulated my bowel movements to everyday instead of every other day or every two days. I had not been regular in moving my bowels for years! This is the first time that I have been able to go when I should, even two times a day at times. In my stool I noticed strange things coming out, but not scary things. They kind of things that make you wonder and say "what is that!" I'd like to mention also, that my nails are growing at an alarming rate, and my hair shines much more than before. I have been getting compliments on how healthy my hair looks and how great my skin looks. Many people have told me that my skin is absolutely glowing and they want to know what am I doing. Generally, I am in good health and DE is helping me maintain that status. Thank you so very very much for this wonderful product! You can best believe I have shared my 50 lb bag with others and they have raved about the great manifestations the DE has given them. I am spreading this information along about what DE has done for me and others so can order their DE as well. Dear Smith Family and Earthworks Associates, I'm writing to thank you for giving me back my husband's health. Not long ago, his blood pressure and cholesterol numbers were off the charts... on the bad side! Worrisome bad! No matter what we did, what prescriptions he took, what we ate... nothing seemed to make much of a difference. And then we discovered Earthworks! Actually, a dear friend told us about your product. He's been taking it for decades, and he swears it's what gives him his health and bountiful energy. We checked out your website... and thought, why not? We ordered 10 pounds of your product, and began taking it religiously every morning with coffee. We're only a couple of months into taking it, but I can tell you that it's already having a positive effect on my husband's health! Just last month, only one month into taking the product, his bloodwork came back with astounding numbers... his cholesterol is 10 points LOWER than it was while taking the doctor prescribed medication! And our doctor said, "Well, it's probably a combination of the two things." But the truth is, he quit taking the prescription! So it's absolutely due to the diatomaceous earth! And his blood pressure is now at normal numbers, too! We go back to the doctor in two days to have more bloodwork done, so we'll see how much more of an effect the silica has had, but I honestly expect to hear good news. So, thank you... thank you for providing this product! I'm sold! What a change in my life the DE﻿ has made.Off several meds now. Skin is glowing ,hair and nails are healthy too. In the garden is doesn't bother the worms or tiny frogs. I get everybody I know to try it and all my family is crazy about it. DE has changed my life. Here's my testimonial: I started the Dirt only 2 weeks ago and already I've seen great changes! I had heel pain every day after work and had to have my husband massage my feet before bed. But now, no more pain! Not even a trace of heel pain. I did a face mask and my skin felt so soft. I love it. I drink it every morning with my orange juice and gives me a boost for the day. Wow! Fantastic product. I have Psoriasis in the worse way on my hands and feet. I got it from using soap over the years I have neglected it and since spending hundreds of dollars trying to find a cure for it at the doctors office. It has been at least 15 years and 2 doctors later and the creams prescribed to me made it twice as bad. I was ashamed to use my hands when receiving change at the check out stand or to show my feet in the summer time. The skin is dry, flaky, red and sometimes bumpy and when people see it they are shocked and at times ask me what happened. I took a little of this product and mixed it with water and rubbed it into my skin and the flakes began to fall off. It improved the texture with just one use so I continued to uses it internally and externally. What I discovered after taking it two to three times daily, my skin now looks radiant, new an supple and yes youthful among other benefits. I'm 45 years old and I was beginning to see dry skin and poor elasticity on my face around my mouth and chin area-- this bothered me, but to my suprise this problem is clearing up. This product is my fountain of youth. I also have more energy and exercise more because of it. I feel great! I started taking DE three weeks ago. I am taking the rounded tablespoon each morning. I had pain in my hips at night, now it is gone. I had dry cracked skin on heels, elbows and hands, now it is gone. I had a dime sized age spot on my face and a number of smaller ones on my hands, now they are gone or going. I have more energy, and sleep better. I also have Type II diabetes, hypertension, high cholesterol and baldness. I can?t wait until my next checkup to see what happens with the labs on those. I also look forward with great anticipation to our first battle with fire ants. I have been taking Diatomaceous Earth for a little over 2 months with some interesting results. Within the first month, I could tell a difference in my nightvision. It was much sharper and more clear. As I have had less than wonderful night vision my entire life, this was indeed a wonderful surprise! Also, I have had fibromyalgia since my teens. I will be 55 in January. The last four years have brought more difficulties with joints and bones with less flexibility in muscles and joints. I am very pleased to say that for the first time in years, I can lift my leg and turn my foot up to work on it with the pumice stone in the shower! In general, I seem to be experiencing less pain. My nails are shinier and seem to be growing more rapidly. I am a therapeutic massage therapist and I am recommending this product to all my clients who are open and receptive to supplemental therapies. thanks! I have been taking DE for several weeks and really didn't think I would have much to say this soon. I retired from an office job because I could no longer use my left hand to file papers two years ago. I have had constant pain from a lack of cartilage in the area at the base of my thumb making it very painful to use. Initially, not using my thumb would control the pain but during the past year nothing has been able to bring relief and I was told the the use of nSaids would only further deplete the cartilage and they didn't help that much anyway. This left me with nowhere to turn. It was at this point I began taking a daily dose of DE with my morning OJ. I had some problems with the full tablespoon dose and had to drop back a bit for a week but am back up to the full amount with no complications and feeling fine. I am AMAZED and very pleased to report that I am nearly pain free...........I can bump the area and make it hurt for a bit; but it is soooooooooooooo much better and I expect it to continue to get ever better as I continue to take the DE. What is taking place is blowing my mind. I had x-rays taken over a year ago and it was obvious that we were looking at an area that was bone on bone. An orthopedic surgeon did injections to help, but that only lasted a few short weeks at best, only lessened the pain and was pretty pricey (it was supposed to take care of it for a year at a time). I do not understand what has happened here since I have been taking DE; but I certainly understand pain relief! I wore an elastic brace to just try and keep it from getting worse and I have not had to wear that in over two weeks at this point. From my experience, I would highly recommend this product for anyone. You might want to go a bit slow for a week and maybe only take a half dose if it bothers you at all. I am so glad I did not give up; it is utterly amazing how much better I am and I have done nothing different other than the DE! I am giving everyone samples and recommending that they continue use. God Bless you...............I love what this stuff has done for me! I am so a believer now!! I am a breeder of Anatolian Shepherd Dogs and have been using Diatomaceous earth for at least 10 years to keep my home, my yard and my dogs free of insects and parasites. I have also been giving it to my dogs for internal parasites. I have a now 11 year old male who had been getting stiffer over the last few years and I was not looking forward to the time when I would have put him out of his pain. Right after I started giving him the DE for internal parasites, I noticed he was not having as much trouble getting up as he used to. Over time, he got better and better, and while he is not running around like a youngster, his quality of life has improved enormously. After running across your site and learning that humans can use DE also, I started using it for my arthritis ... not really expecting any difference for a few months. After taking DE for less than 3 months, I can now walk up stairs easily without dragging myself up by the railings. I am losing weight gradually and didn't even realize it until a friend asked me what kind of diet I was on because I was so much thinner than the last time she saw me. Since I had not been dieting, but had been eating the same as in the past, I was surprised when I got on the scales and saw I had lost 11 lbs in 3 months without changing my eating regimen in any way!! And, the one thing I really like is the texture of my skin has improved drastically ... used to itch all the time ... not anymore and it feels so much softer. I just cannot say enough about DE ... I tell all my friends and, of course, I am a walking advertisement since I have changed so much and they can see the difference in me. All I can say is ... thanks so much and God bless you for making something so good affordable for those like me (I just turned 65) who are on a fixed income and cannot afford expensive arthritis meds. I don't know what I would do without you. I was on the Internet searching for a de-worming medicine for our kitten when I stumbled across this site. I had never heard of Diatomaceous Earth before but once I started reading about it I couldn?t stop. I searched the Internet for a solid week finding all the information I could regarding DE. First thing I discovered was I think everyone should be taking this DE for the over-all health. The second thing I discovered was your site provides the best deal around to buy DE. I have been taking DE for 4 weeks now and I no longer need to take my anti-depressants that I was taking. I feel great when I wake up in the morning and seem to have more energy all day long. Thank you for offering DE at a great price. I will tell everyone I know about it. Hope you are fine. I started taking DE and I have been recommending it to all my friends, and some have already ordered it. I was diagnosed with breast cancer last July had two surgeries lumpectomy, gone thru the journey of chemo 6 rounds and 8 weeks of radiation every day, but now a 5 year pill, Aremidex started in June is killing me, so an angel knocked on my door and introduced me to your product, and I have been on it for about three weeks and I am feeling great, less joint pain, urinating better, skin looks better, moods are stable not irritable, more energy bowel movements are not so runny leg and ankle, wrist, and hip pain gone, and no more pains and tightness in chest. Thanks SO much! Im 68. Dealing with chronic fatigue and a mosaic of health problems stemming from birth defects caused me to seek alternative things to restore my health. From not feeling good enough to get out of bed, last winter Ive gotten to where can work all day. The chronic tiredness, cravings, worst of the asthma symptoms are gone. My hair shines, my eyes are bright, Im not having skin breakouts on my back, some of the swelling is going down, the chronic diarhea Ive dealt with for almost two years, is gone. That alone is worth it all. Its awesome to feel the best Ive felt in several years. I have an artificial heart valve artificial aorta plus other health issues Im so happy to find something that makes me actually feel good. I want everyone to know how good this stuff really is. I am loving the benefits of Diatomaceous Earth. I am now in my third week. My neck had been very tight and "creaky" on the left side and chiropractic and massage therapy hasn't really taken care of it. After 2 weeks on the D.E. it has improved considerably and there is only a little tightness left. I am confident that it is going to be 100% very soon based on what I am feeling so far. I also have seen an improvement in my hips which are also extremely tight. I know that one day in the near future, I am going to be able to cross my legs like a lady which I haven't been able to do for about a year. Thanks so much for a fabulous product!! I started taking shell flour 3 years ago for arthritis. My hands were so bad that I couldn't hold on to a coffee cup and could not sleep because my hips would hurt so bad and my friend told me about an article she read telling about diatomaceous earth. Within 2 weeks of taking it 2 times a day my pain was gone. I also gave some to my sister for her 16yr. old dog that could hardly walk and 2 weeks later she called and said that he was almost like a puppy again.I am sold on it . This is another testimonial you can use in more recent feed-back. I started my elderly father, age 85, on your product over a month ago. He had a check-up today at his doctor's office, and his blood pressure is now excellent! Much better than it was for years. His doctor reviewed the information I was given about your product (DE) and gave it full approval. My dad's bowel movements are also more regulated. Thank you for your great product! Last month I ordered some Diatomaceous Earth because a friend had recommended it for my wife. She had a severe case of psorisis on her elbow. After a few weeks of putting a paste made of the stuff and taking a tablespoon a day as you recommend, it has almost cleared up. Nothing else has worked. Thank You!! I am a diabetic, whose diabetes has been out of control. I am on two different pills twice a day and 1 shot of Byetta twice a day, event though I am on all of this medicine my blood sugar has been running between 206 and 400--not good. I decided to try Diatomaceous Earth, I take 1 tablespoon per day and I can not believe how great I feel, my blood sugar is down to 164 (still high but much better) I have only been on Diatomaceous Earth for one week, I can not wait to see how much better I am doing after two weeks. I also have a lot more energy and with my blood sugar down I am not hot all of the time, living in Texas this is a good thing. I just want to thank you so much for your wonderful product and I hope there are more people out there ready to get started on feeling better. A. La Lone from Texas. I've purchased your product and have been taking it for about a week. I noticed a difference in how I felt almost immediately, around the third day. I just feel better, I definitely have more energy, maybe due to the minerals it provides that were lacking from my diet. I have not had any cravings and I am feeling less hungry all day. My skin is already visibly better, smoother--there's a glow to it I had not seen in a long time and the fine wrinkles I had are virtually smoothing out--disappearing. Works on People and Pets! I started my elderly father, age 85, on your product over a month ago. He had a check-up today at his doctor's office, and his blood pressure is now excellent! Much better than it has been for years. His doctor reviewed the information I was given about your product (DE) and He gave it full approval. My dad's bowel movements are also more regulated. Thank you for your great product!